As I write this many people in the state are struggling with the incomprehensible damages resulting from the June 24 flooding. I have several friends who are now without a home, or much of one. I am heartsick for them. I can’t put it into words. My basement office/craft room/sewing area is in a shamble because of the remodel and move. Water got in the basement from the flood event. It was not much water. It was just enough to mess up a few boxes. I am thankful I still have a home for water to get in. This month we are making a solar lamp from a jar and a broken solar yard light. 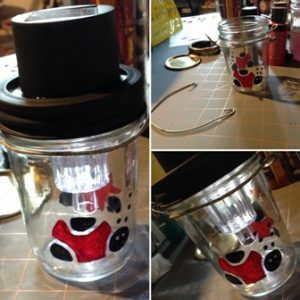 I frown on purchasing Canning jars for projects, this is after all upcycling. The pint jar I am using here is chipped and of no value to home canning. I have a ton of these that were left in the house. The stem of the light broke off. Glass paint and brushes (optional). Start by tracing the size of the light on to the jar lid. Then draw a slightly smaller circle inside the first. This second circle will be the one you cut out. You want the solar panel section to sit on top of the lid, with the light below it. I used tin snips to cut the hole. Spray the lid and the ring only with the black paint. I used flat black, not glossy, to match the solar panel. Do NOT spray the solar panel. Cut the clothes hanger with the wire cutters and straighten out the best you can. Measure around the jar and add two inches. Twist the cut ends together and make a loop. Bend and twist the wire to make a second loop across from the first. This is the difficult part. Tighten the wire around the jar by twisting the loops. Use the remaining wire to create a handle for the light. Twist up the raw ends to hook around the loops on the jar. Place the lid and ring on the jar, insert the light and you are done! You may consider using some caulk to prevent water from seeping in the glass during a storm. If you want to paint the jar you will need some glass enamels. They aren’t overly expensive, but are a bit pricey if you do not plan to use them often. If there is a particular project you’d like help with, email me at robinholstein@gmail.com. Put “Everyday Upcycle” in the subject line so I don’t delete it by accident.